Hi, I wonder whether you could give me any advice on when I can commence diving again. I fractured my wrist 4 months ago, My consultant has said it is fine for me to dive once I feel that my wrist is strong enough (which it is now) although I now have a steel plate in my wrist which is compressing the median nerve & causing light numbness in three of my fingers. Can I start diving now? As you say you have full power and ability in the hand. So you can use it to dump, fiddle with a loose weight belt, and do that fine finger co-ordination needed to pull the last of the snot from your nose after a dive. Make a note of the sensation loss in the hand, and if ever you end up having a rapid ascent then tell the dive doc you had it anyway as it is a classic bend symptom. You don't want 5 unnecessary hours in a pot due to over enthusiastic diagnosis. I have recently had both knees totally replaced. I wish to return to diving as soon as I am fit enough and have recovered the strength in my legs. I will build up the muscles again by walking exercising and swimming. The operations were performed in December. What I would like to know is: At what stage will it be safe for me to recommence diving? Having had the knees replaced recently, is there an increased risk of developing the bends in my knees? Should I initially limit the depths that I dive to? If so, to what depth, and for how long. I am 58 years old and overweight, but with no other medical problems. I am a Advanced Open Water Diver with 84 dives in the last year, and I only qualified a year ago. I have never experienced any diving related problems in the past, most of my dives have been to below 20 metres and regularly below 30 metres with a 42 metre max, all on air. I am sure that this is not an easy question to answer, but I would appreciate whatever advice that you can offer. It's a pretty major operation you have had there, but one from which you should make a good recovery and be able to dive again soon. I would say that you need to talk to your orthopaedic surgeon about exactly when you should go back into the water. But as a rough guideline people usually regain full function after 8 to 10 weeks post operation. I think you should wait this long but you also need to really work on your thigh muscles to get them as fit and strong as possible. Obviously the key here is when you are finning, and I think you should stay well away from strong counter current dives as you may experience problems there. It would also be a good idea to get the best set of fins that you can get as these can really help you if your knees are weaker than before. As you describe yourself as overweight, you really must loose as much weight as you can. Your new knees can only take a certain amount of wear and tear and so the less weight you have going through them then the longer they will last, and besides that if you are too overweight you shouldn't be diving. As for whether you are more prone to a bend in the knees, well as they are now made of metal you wouldn't really be able to tell. However in the area surrounding the replacement, as the operation may have slightly affected any tiny capillaries then there is a theoretical risk that it may be harder for any nitrogen to be transported away so again, always dive well within tables. I don't think you need to restrict your depth of diving to any particular level but you should only dive as deep as you are qualified to. Another very important point to note as well is that one of the side effects of this operation is that a nerve called the common peroneal nerve can get damaged. This can be told by a lack of sensation above the instep of your foot and it is worth noting this as if ever you are suspected of having a bend the doctor may feel this to be an important symptom of DCS and end up putting you in the chamber, whereas if the doc already knew this was present it could save you a 5 hour decompression! Finally I would add that on long flights you may have a greater chance of getting a clot in your legs, i.e. a deep venous thrombosis so always stay well hydrated and take a walk down the aisles every hour or so to prevent this. I am an experienced diver who had a double arthroscopy operation in mid November 2004. I am booked to do a 50mtr chamber dive up in York this coming March, the staff at York can't give me an answer on if I am going to be considered safe to take part, based upon my operation. I feel ok about it, but am I putting myself at too greater risk of the dreaded DCI taking into account my recent history? You'll be fine. An arthroscopy is fairly weedy in the scale of ops you can have in our fine hospitals. It's more investigative rather than operative. A little nick, and then a steel rod into your knee, so the orthopaedic surgeon can have a gander at your cruciates and menisci. It causes little damage so a dry pot dive is fine. It is worth noting here though that damage and scarring to areas of your body wont necessarily invoke a bend at depth, they may off gas slower, but they on gas more slowly too. All even at the end of the day. 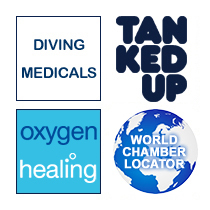 I have had 2 "fit to dive" medicals with you over the past 3 years & have recently certified as a PADI Divemaster. I now wish to book my first HSE medical. My difficulty is I have badly damaged knee joints (caused by cartilage removal from both knees over 20 years ago). My colleagues tell me that part of the medical involves climbing steps to a metronome & I am very concerned that I won't be able to do this (sometimes I have to lean on the banisters to support myself up the stairs if my knees are feeling unstable). As I understand this test is to enable you to evaluate my post-exercise heart rate, is it possible for me to exercise some way other than putting a strain on my knees?? I consider myself, otherwise, perfectly fit for dive-mastering & did a 3 month dive master internship in Gozo last summer without difficulty. I am asking now so I can decide how to proceed if the stairs are an essential part of the process. Thank you very much for any advice. Oooh, I think I can think of plenty of different exercises to get the heart rate up, that wont mess up your knees any further. One of my favourite patients, a certain Nigel Band, well known to the tecchie Trimix rebreather-mongers amongst you, in fact invents his own exercise each year. As long as the heart rate gets to the max predicted, and comes down to normal when it should then I don't really care if you do head stands, ride a bike or press up like a Latino lover who has been told he has a week to live. A word of caution though, is that if your knees do stop you from finning properly, or dragging a bent diver out of the water, then look closely at DM'ing, as you are the support man for for the trainees around you. I suffered a ruptured patellar tendon in November 2006 which was surgically repaired the next day. I then spent 8 weeks in a full cylinder cast with the leg in extension. I had a leg brace at 30 degrees for a further 3 weeks and now the brace is at 90 degrees for a further 4 weeks at which time it will be discontinued. I have started physio, but I wonder about any implications for diving in the future. In theory, once fully rehabilitated, it should be fine but if there anything I should consider after that? Also, as an instructor, I have an annual HSE medical - is there any impact on that? Awesome, 14 weeks with your leg at various comedy angles. I suppose that’s 2 months wheelchair-bound, 3 in metamorphosis, and the last 4 apologising to people on the Tube as they feel that naughty bump on their butts as you turn. Bad luck mate, I will avoid the same by remembering to do no physical activity from now on. Here’s to potatoes and my couch. Anyways, once it’s better, your knee will be as good as new. Dive with the best ergonomic fins when the physio gives the OK, and as for the HSE medical, there are alternatives to the steps to get your heart rate up. A tax demand, parking tickets and Ken’s C charge will do that. Or we could give you a lower step for longer. Either way you will be Instructing. For about two weeks I have had a swelling on the elbow, I have seen my doctor this morning and was told that I have 'Olecranon Bursitis' and have been prescribed 600mg Ibuprofen to help reduce the inflammation/swelling. I did ask if I would be OK to dive? To be informed only if it is not causing you any pain. I have a dive planned for the 27th December (the annual Christmas club dive). Will the elbow cause any problems if I undertake this dive? It’s a functional thing. If your elbow is able to bend to do all those divey things, like putting on the kit, launching the SMB, reaching for the up or down button on your BCD, then go for it. However if there is gross limitation of movement, or pain, forget it. The elbow joint, where the radius and ulnar articulate with the bottom of the humerus, is all held together by a fibrous sac called a bursa. Inflammation here will fill up the sac with fluid, and cause this olecranon bursitis. Normally it looks like your elbow has grown an apple in it. That’s the fluid. I hope your doc has stuck a needle in and drained some of it out, as that speeds healing up. But for now stick with the ibuprofen, wear a tight elastic support stocking-like thing on it to prevent any more fluid build up, and enjoy your festive-fun-dive. Sounds cremasteric reflex inducing to me. What’s that? Guess, no prize for the winner. Having never played a round of golf in my life, or even brandished one of those stick things in anger, I have been diagnosed with "Golfer's Elbow", or a case of tendonitis as it was also put. I work in a dive centre and so the cause is easy to understand... lifting cylinders, kit and anchors. I have been given anti-inflammatories, and have an appointment with a traumatologist this week. Relaxing the lifting is easy... get the customers to do it! But, I am concerned with the uptake of nitrogen in the "traumatised" tissues. I generally dive twice per day, six days per week. The morning dive is the deepest with a 30m max limit, multi level, with an average 50 minute dive time, 3 hour break then an afternoon dive to a maximum of 20 metres, again multi level with an average dive time of 50 minutes. Am I unduly concerned, or should the diving stop for a while? We should re-christen this “medial epicondylitis” (to give it its true medical name) as “Tank Lifter’s Elbow”, you’re right. This is one of those perennial diving concerns, which seems to stem from many anecdotes of recurrent symptoms in previously injured areas of the body. I have to say that I’ve yet to see any convincing evidence that DCI is more likely at the sites of old trauma or scarring. That said, I do not dismiss the fact that many divers seem to get aches, pains and odd sensations in areas of prior damage. Quite why this happens is a bit of a mystery. It is likened in a way to the old granddad whose arthritic knees begin to play up just before rain. In the ‘60’s a rheumatologist called Joseph Hollander built a special climate chamber to investigate this phenomenon, and found that what was previously thought to be an old wives’ tale was a demonstrable clinical reality. The currently favoured explanation goes like this: uninjured tissue is relatively elastic, compared to scar tissue, which is stiff, fibrous and dense. Hence pressure changes will cause expansion and contraction in healthy tissue, allowing gas to diffuse as normal. The scar tissue in old injuries distorts and is pulled about, often causing pain and inhibiting the easy movement of gas. As a consequence, one could postulate that once nitrogen is taken up by scarred areas, it lingers and increases DCI risk. A nice theory, but one not supported by experiments so far. The bottom line then, is that we don’t really know whether this connection between scar tissue and DCI exists. It’s probably safe to say that in small areas, for example broken digits, healed cuts etc., there’s little to worry about. When we’re talking major surgery though, especially that around regions prone to DCI anyway (eg. spinal operations), it might be prudent to take a few extra precautions with regards to conservative diving – minimising bottom depths and times, using Nitrox, keeping profiles square and avoiding deco where possible. I have Kienbock's Disease and was concerned about increased chances of DCS when diving. Is it something I need to be concerned about? I was fine when I did my PADI Open Water & my Advanced courses. Also in the past I had a dislocated knee which chipped bone from underneath it. It's been fine since and hasn't come out in years but I just wanted to make sure that it won't be affected by diving. Also I chipped a piece of bone off an ankle years ago, which healed but the chipped bit has healed away from where it should be. Again I've had no problems with it since. Another issue, another eponym… Kienbock was an Austrian radiologist who first described breakdown of the lunate, a moon-shaped bone in the wrist. The precise cause is unknown, but it’s rare and most likely a complication of trauma. The initial injury can be innocuous (even a mild sprain can lead to so-called “avascular necrosis”, where the bone dies as its blood supply is interrupted). Pain, stiffness and swelling are the most common symptoms, which eventually start interfering with manual dexterity. At this point surgeons generally intervene, although quite how is controversial (surgeons in my experience don’t agree on much). As I explained last month, there is some anecdotal evidence that DCI occurs more often in previously damaged or scarred tissue, but there is no scientific data to back this up that I am aware of. So as long as the Kienbock’s does not impair you functionally at all (in terms of the use of your hand), I’d say you could dive safely with it. Similarly this would be the case with the ankle chip and the knee – if you’ve had no problems in the recent past, then finning should not cause a further dislocation.